The history of the Ted culture is a fascinating one. Originating in London in the 1950s, a rejection of post-war austerity and a rebellious response to American rock and roll music saw in a subculture characterised by its iconic fashions and vicious gang activities. 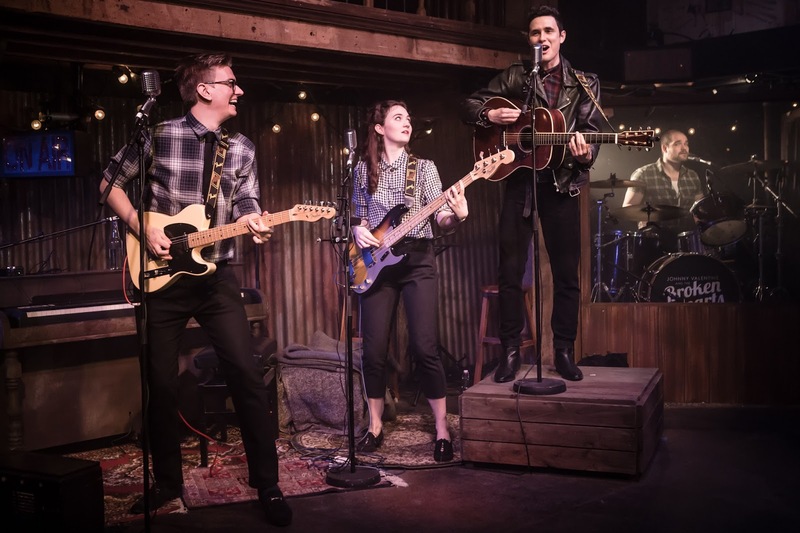 Partially inspired by true events, Tristan Bernays and Dougal Irvine’s rollicking musical Teddy follows a pair of Teds on a mission to track down their musical heroes, Johnny Valentine and the Broken Hearts, at a secret gig in London. A fateful mission which will change both of their lives in ways they could never imagine. Right from the start Teddy’s focus is on the music. The audience is treated to a couple of preshow tunes courtesy of Johnny Valentine and The Broken Hearts. The original songs are all rock and roll inspired and accurately mimic the music of the era, with the musicians (Harrison White, Andrew Gallo and Jenny O'Malley) giving off distinct Buddy Holly and Eddie Cochran vibes. On the other hand, dressed in leather jacket, as the hip shaking, lip twitching frontman Johnny Valentine, Dylan Wood evokes another legendary rock and roll icon. Enthusiastic dancing compliments the lively music, and achieves a sense of reckless chaos with only two actors on stage. An impressive feat, which showcases the skill and dynamism of Teddy’s central couple, as well as the gripping choreography by Tom Jackson Greaves. An unusual feature of Teddy is its dialogue, which takes the form an extended rhyming duologue, performed by George Parker and Molly Chesworth, who portray a number of characters throughout the show. The rhyming dialogue is certainly a distinguishing feature, and while it alternates between wistful and droning, the former normally dominates, and gives the entire piece a nostalgic tone, as if the whole audience is recalling the evening at the centre of the action from their own memories. At times during the slightly overlong first act, the rhyming dialogue becomes slightly tiresome, but the spry second act banishes that, with an adrenaline-charged plot and constantly escalating stakes. The production exudes a sepia toned 50s aesthetic, from the rusted illuminated ‘T’ which greets audiences in the bar, to the warm glow of the string lights which adorn the auditorium, and dually allude to the makeshift aplomb of Ted culture, as well as the austerity of its post-war roots. A clever detail from lighting designer Christopher Nairne. Additionally, Holly Rose Henshaw’s well researched costume design captures the shapes and fabrics of the Edwardian inspired Ted regalia. 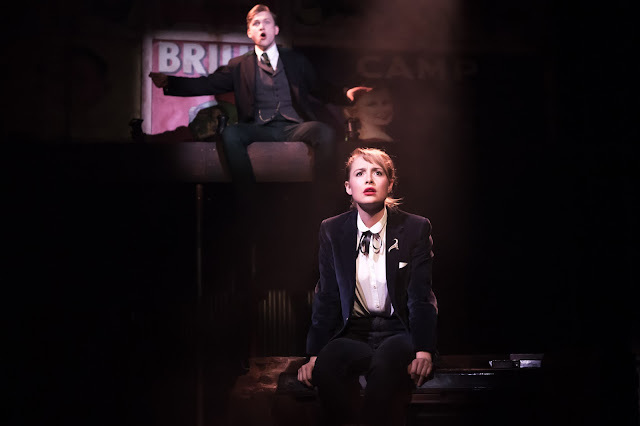 Although it would benefit from a slightly shorter first act to match the sprightly pace of the second, Teddy is an urgent and engrossing glimpse into one of the most iconic subcultures of the 20th century, and will have audiences bopping all night.